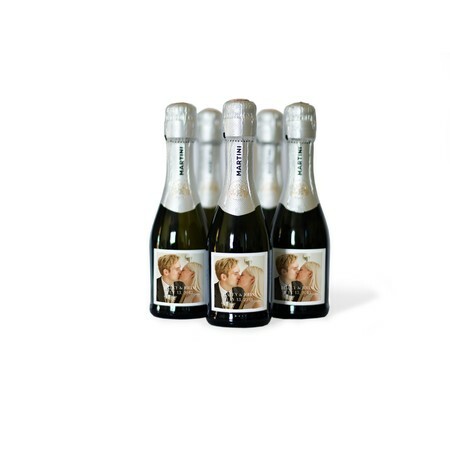 Make your wedding pop with these fun and memorable personalized mini champagne bottle labels. Show off your favorite photo at the main event or hand out bottles with custom mini champagne labels as wedding welcome or thank you gifts. Mini champagne labels also make a festive addition to your New Year's Eve party festivities. Choose a fun photo and personalize your label for a unique mini champagne label that stands out. Peel and stick mini champagne labels measure 2.25 inches by 2 inches and come in sets of 28 per order. Mini champagne photo labels are also ideal for honoring a retiree or long-married couple on their anniversary. To create a custom mini champagne label, upload a photo from your computer, Instagram or Facebook and personalize your label with your photo and text. Then, peel and stick your mini labels onto your mini champagne bottles. Click here to learn how to professionally apply your mini champagne labels to any bottle.